The sun was shining brightly in a clear blue sky on Saturday. 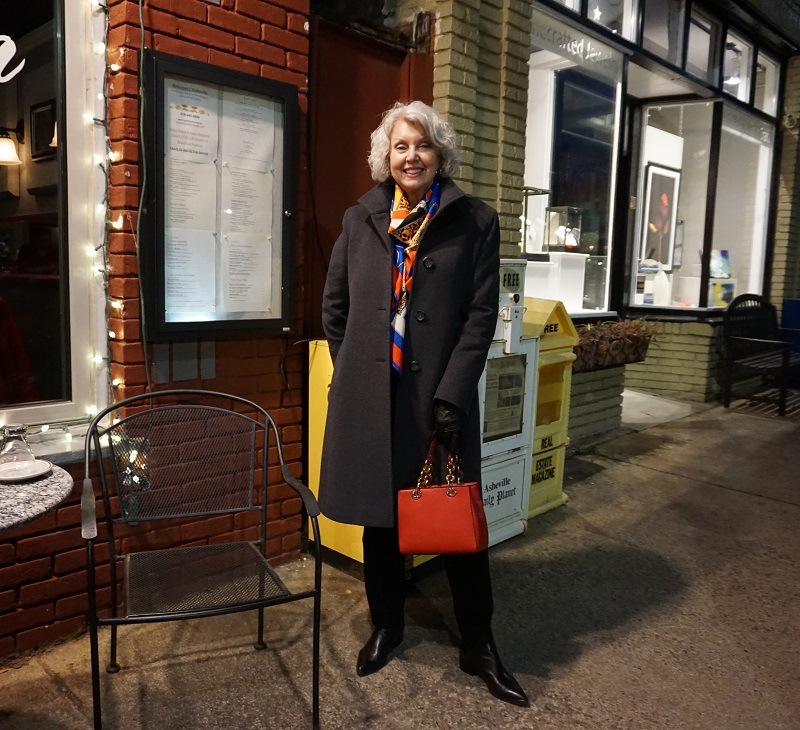 It inspired us to take a drive through the mountains to have dinner at The Glass Onion outside of Asheville in the little town of Weaverville. The key to dressing comfortably for the whole day was layers. The first layer was a long sleeve gray thin T with knit trousers and low black boots to continue the line. 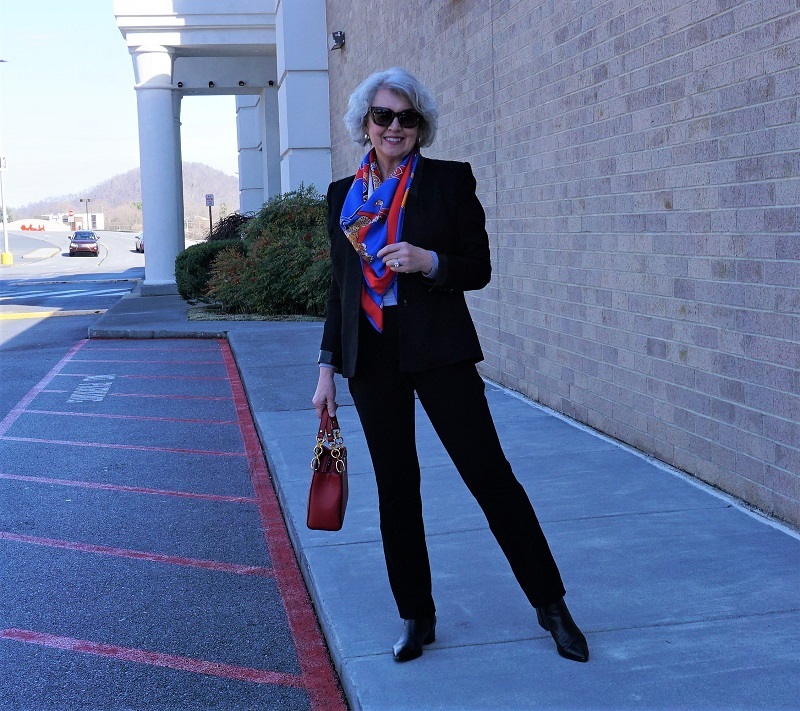 The black blazer with leather trim complemented the black slacks, but they do not match. When I layer the same color of separates, I vary the textures. 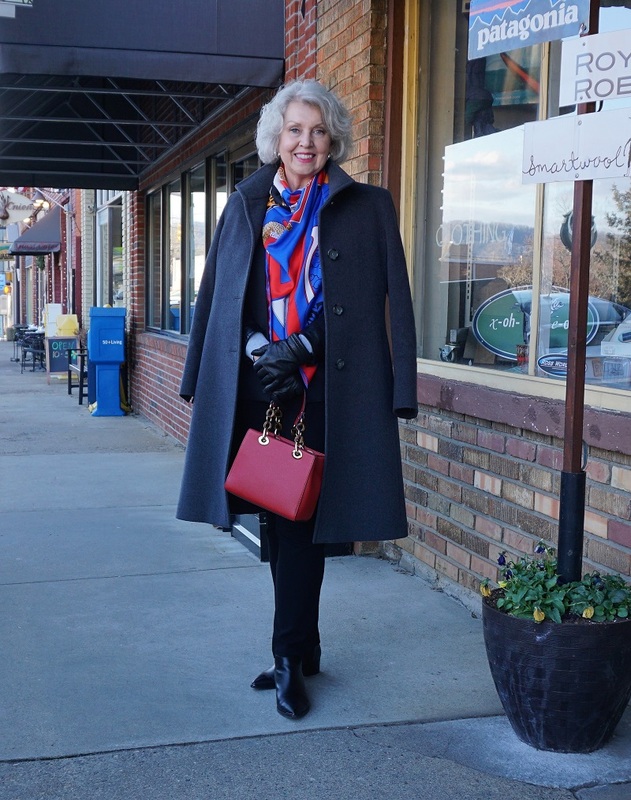 The brightly colored scarf and red bag keep the black and gray pieces from being too harsh. 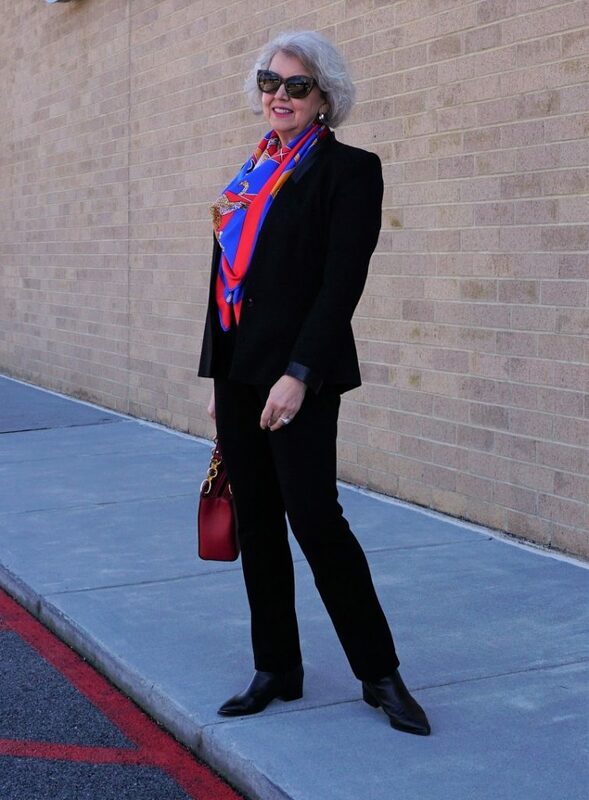 A silk twill scarf can keep me warm as well as add color to the black base pieces I own. I wear scarves effortlessly, and I never expect them to stay the same throughout the day. Sometimes I take them off and lay them in the chair beside me, other times I’m happy I have them because I get too cold. 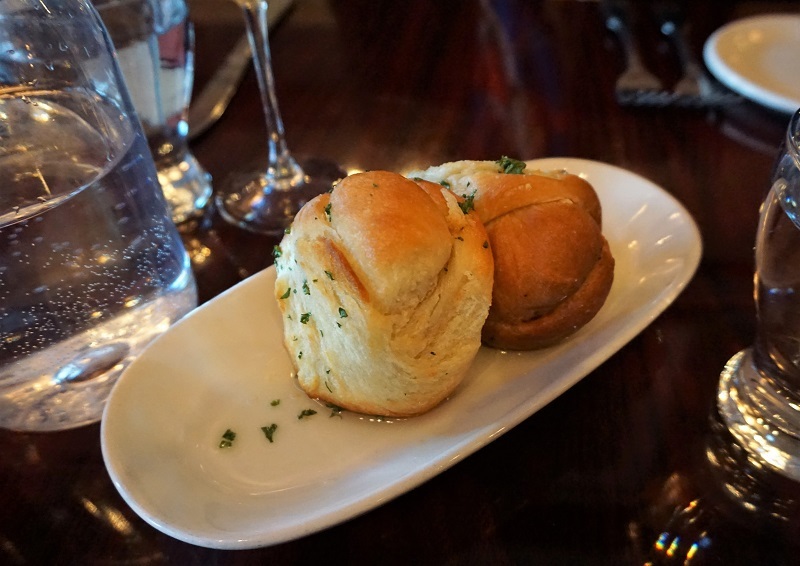 The garlic rolls alone were worth the drive! 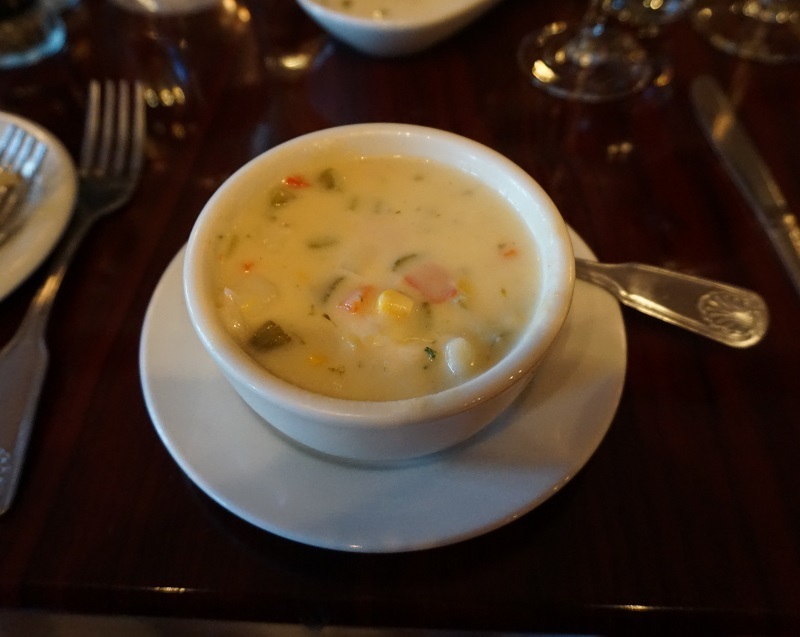 The corn chowder was light and full of the flavors of other vegetables. The corn tasted as if freshly picked from a summer garden earlier in the day. 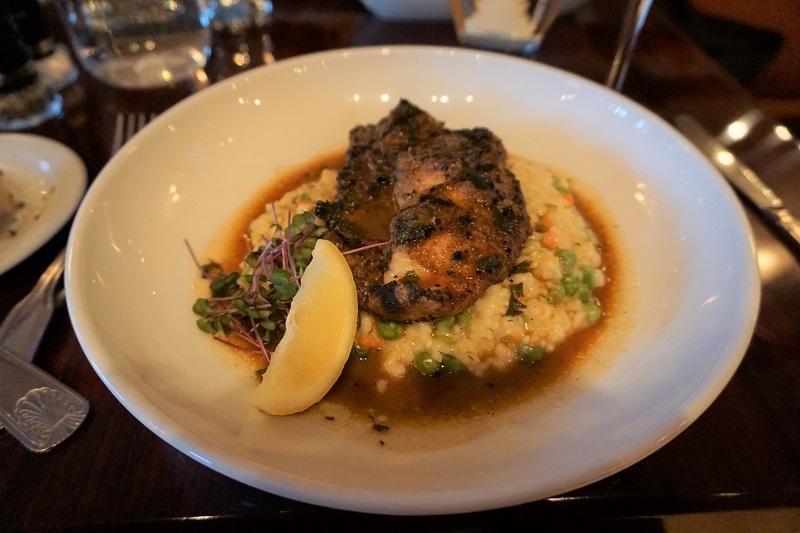 Mr. Mickey’s Monk Fish over risotto was delicious. 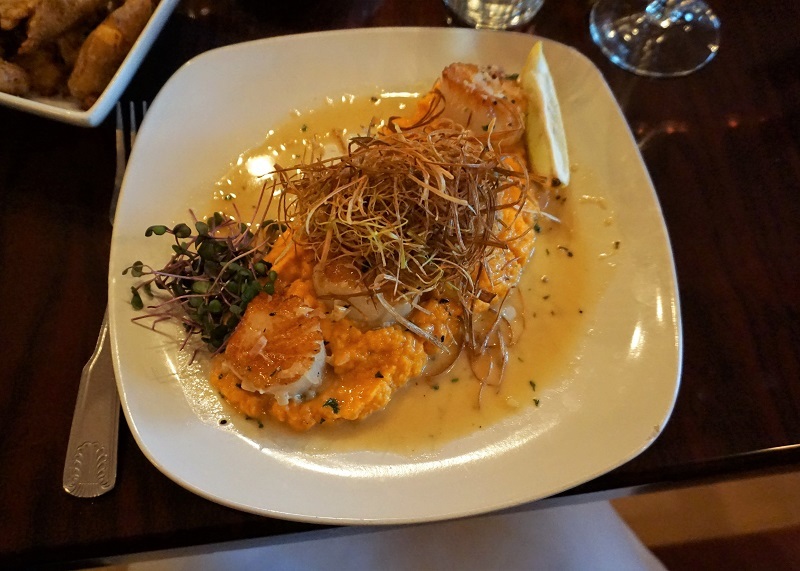 My sea scallops over pureed root vegetables were superb. 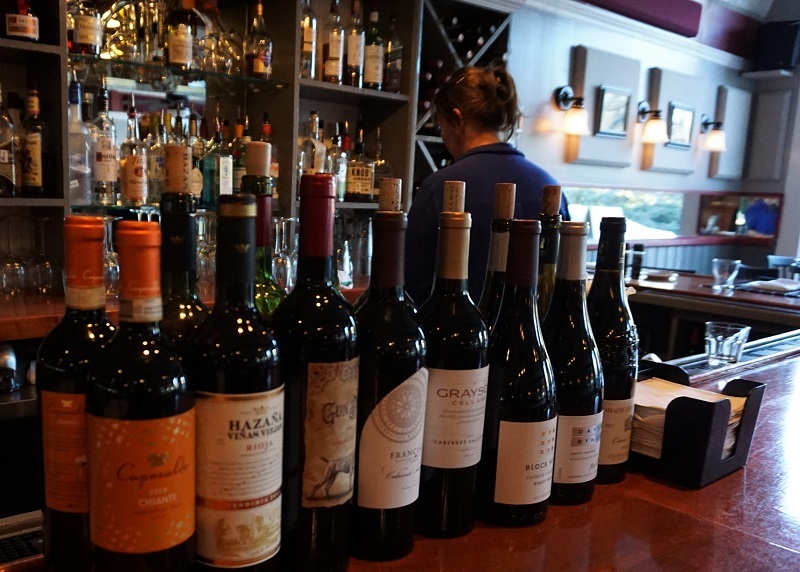 The delicate flavors complemented each other perfectly. 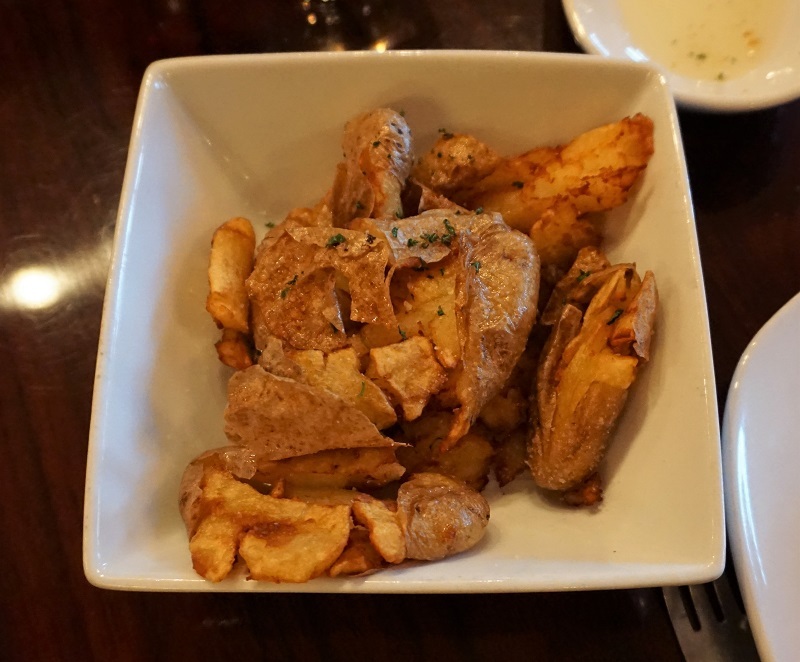 These smashed fingerling potatoes were the perfect side to share. Oops! 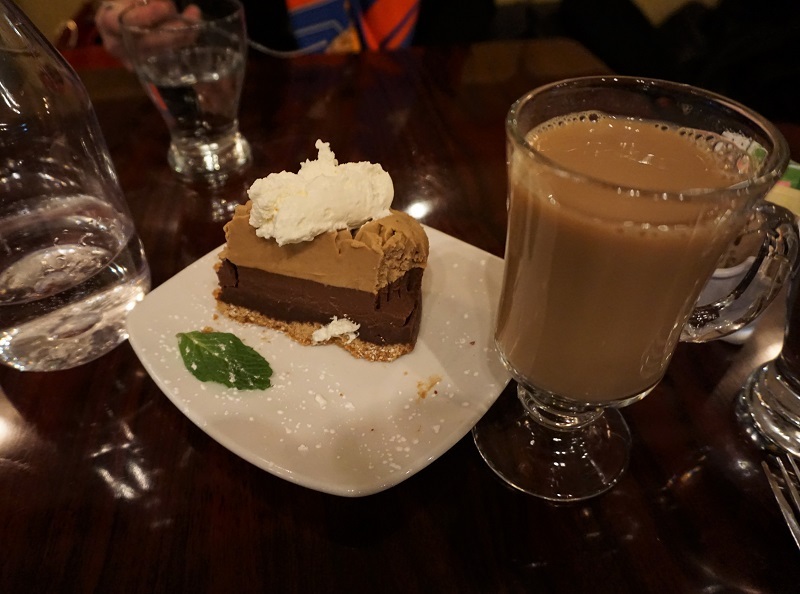 We were so excited to try this beautiful dessert we forgot to take a picture before taking the first bite. Earlier in the day, it was warm enough to go about without outerwear. I was glad I brought a coat and gloves for later in the evening. A similar topcoat is here. Similar leather gloves are here. The Marc Fisher LTD Yale booties are here. The Helmet Lang jacket is from a few years ago. Similar jacket here. The knit pants are old from Chico’s. Similar here. The lightweight knit top is from White House|Black Market here. The Balenciaga sunglasses are old. Similar here. The colorful silk scarf is here from my shopping site. The bag is a couple of years old. A similar bag is here. 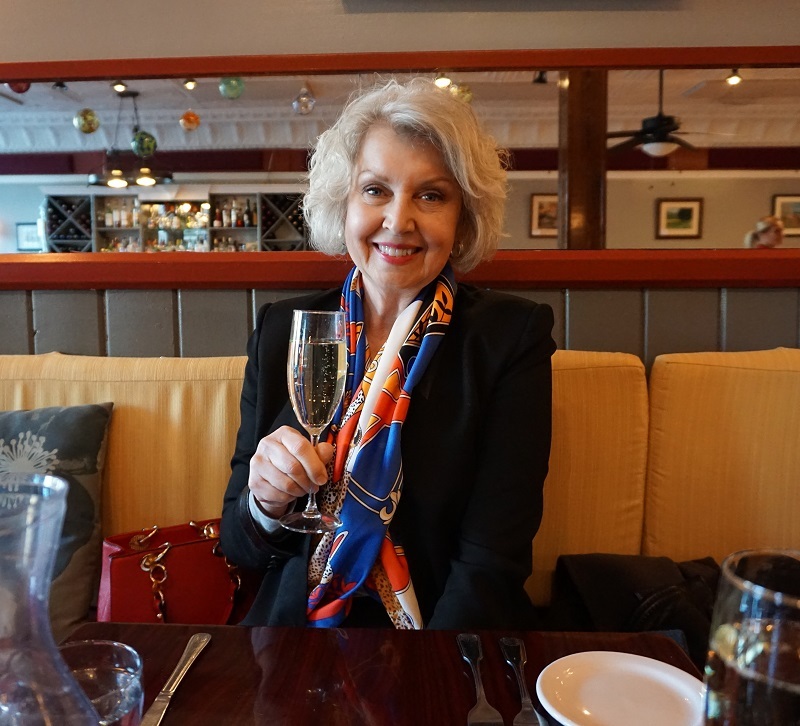 I include a free satin scarf with every purchase from my shopping site here. Beautycounter, found here is my favorite skincare and makeup. French Kande makes my favorite jewelry. Visit them here. I modeled for and still wear Covered Perfectly tops often, they are here. 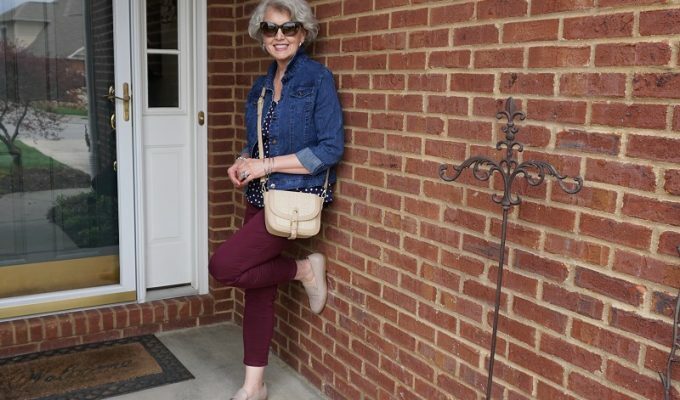 Referral and affiliate links may generate a small commission for Susan After 60 Inc.
SusanAfter60.com is an online space where women can share their thoughts, ask questions, gather style tips, and be inspired. I love how you say you have had some clothes for years. I am trying to purchase some classic pieces as well. I also am looking for things that pack well and come out of the suitcase looking great. I also enjoy buying and wearing scarves. I am glad I found your page for inspiration. I too love your site. I especially love this out fit and wish I could have joined for that fabulous meal. Having just retired I am wanting to pair down and have a few nice classic looks and your site is so helpful. You always look fabulous. Please more info on packing for a cruise or travel ing. 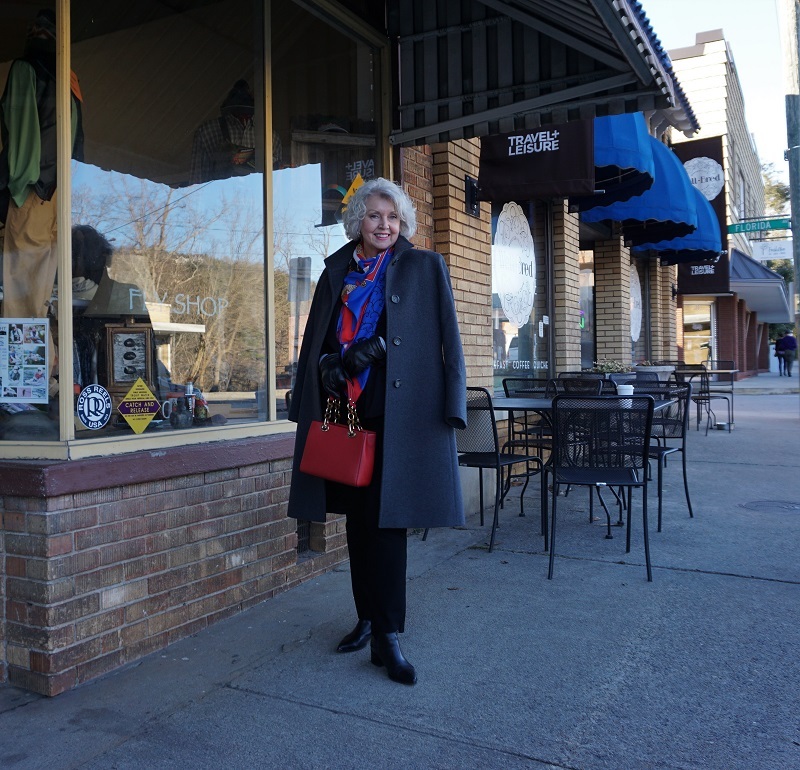 I found Susan’s blog tremendously helpful and inspiring as I began changing my look to compliment my “life experience” and a definitely a bright spot in my day since retiring. I am “formal” challenged planning a QMll transAtlantic. The last few years I have worn palotso pants ..
Events. Is this formal enough? Outfit pictures would be helpful. That is how I often dress for formal events too. I also want to remain covered. I think that fabrics with shimmer and shine as well as a few jewels and sparkles will be appropriate for most formal occasions. You’re an inspiration on how to work hard and enjoy the best life has to offer. Sharp outfit. Great food photos. This is a great look and I love how you explain why you choose the garments you are wearing. You may have shown this in one of your YouTube videos, but I was wondering how you store your sunglasses. It is always inspiring to read one of your posts. I have a little extra space in a drawer which I dedicate to sunglasses stored in their cases. Great blog as always. Susan. Judith, you will be fine in palazzo pants and a pretty top on your trans Atlantic voyage. Knits are perfect and you can wear the same pants with a couple of different tops depending on how many “formal” dinners there are listed. Just have comfortable but attractive shoes, some bling in the way of earrings or necklace and have a wonderful time! Isn’t this a wonderful restaurant? We’ve been there many times, and some girlfriends took me to lunch there for my birthday in November. Their pumpkin ravioli is my favorite. I really like your long coat over your other layers. 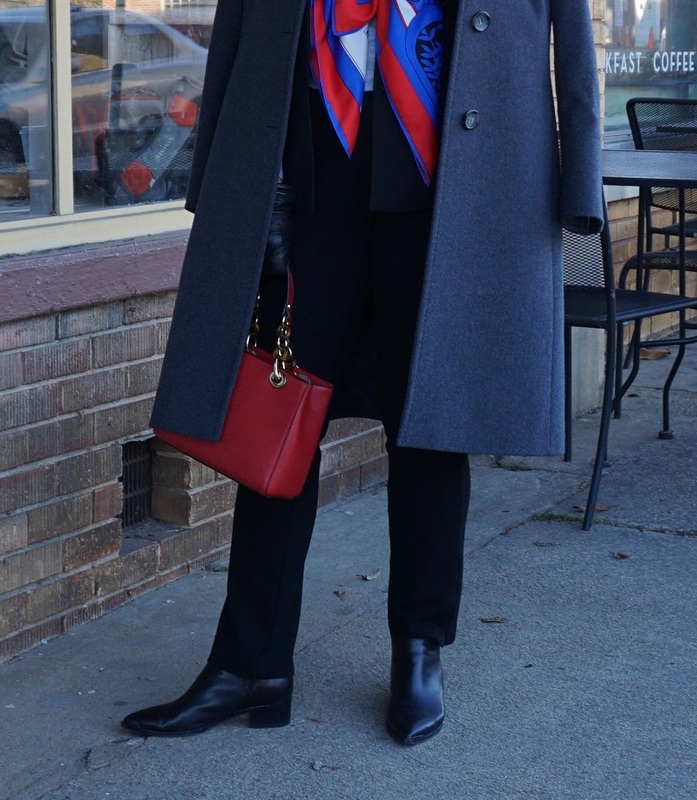 It pops with the color of the handbag and the colors in the scarf. We have enjoyed going there for years. I’m glad you have been there also. It is always a great meal. Thank you so very much for the beautiful scarf you sent with my order of the black dress! I love it! I’m so glad you are pleased. Thank you for shopping with me. I thoroughly enjoy your posts and you have helped me stayed focused on my wardrobe purchases. But I do have a question about an upcoming wedding in April in Cancun. It will be on the beach and I would love to hear some of your ideas for a stylish/classy dress or outfit for the affair. Your recommendation will be greatly appreciated. Your footwear should be flat sandals for a beach wedding. (I would wear my metallic silver ones with a jeweled seahorse on them.) A soft pastel color like mauve or blue would be lovely in flowing pants or a long skirt or even a sundress if you are up to it. 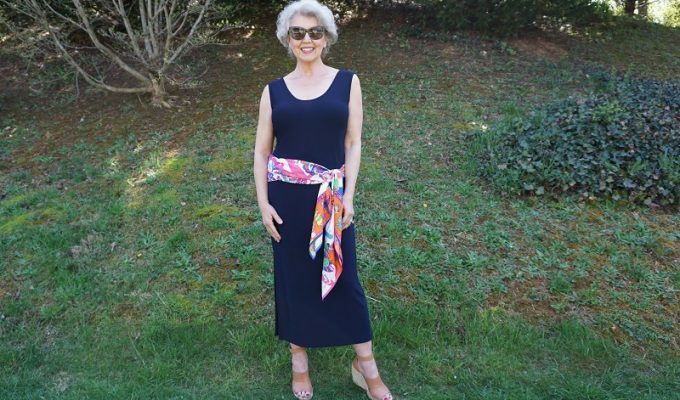 (My example would be white slim fitting summer pants, with a pretty linen top in blue with silver earrings, a large silver ring and I would carry a small straw bag with silver details.) I hope this gives you some ideas. Have fun! 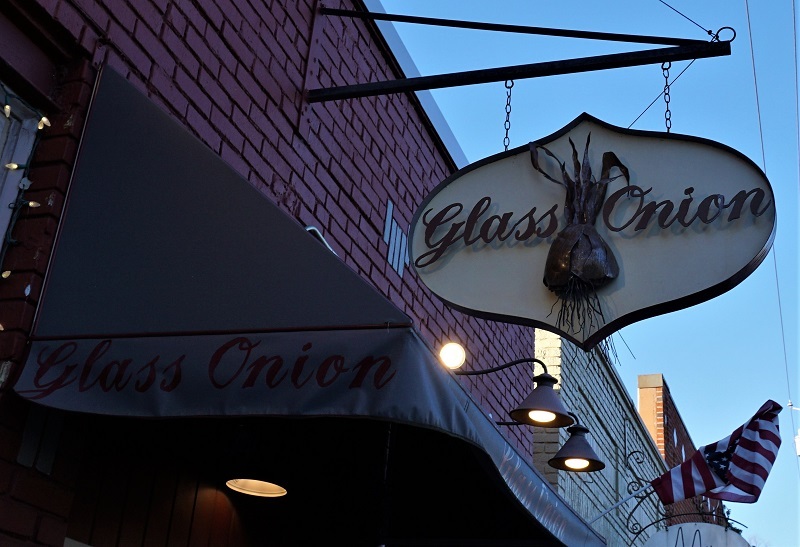 OK, now I gotta try the Glass Onion. I live in Hendersonville, so it will make for a nice Saturday afternoon excursion over the mountain. I’m so glad you are pleased with your purchase. Thank you for your kind words and for shopping with me. I appreciate you.